The first 10 days of larval rearing is identified as a period of high mortality that is followed by high mortality with the onset of cannibalism after flexion; and further mortality due to “collision” of metamorphosed juveniles with the walls of enclosures. 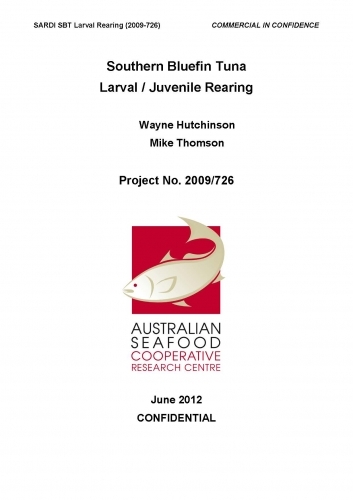 It can be anticipated that these issues will need to be resolved in order to achieve hatchery production of Southern Bluefin Tuna (SBT) fingerlings. This research looked at the entire SBT hatchery “life cycle” from obtaining a supply of good quality, fertilized eggs through to general survival requirements to enable SBT to reach adulthood.